Inspired by a clock design in the book Sew Liberated, I decided to give hoop embroidery a try. I had all the right materials ~ a whimsical design, a natural fabric, a wooden hoop, and the need to try something new. I do quite a bit of hand embroidery already on my dolls and dollhouses, but there is something so delicate and charming about the way this type of embroidery is created. Holding on to hoop, weaving in and out, nothing fancy ~ it all felt a little Laura Ingalls Wilder to me and I loved it! 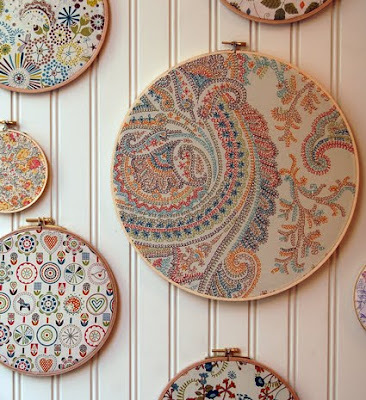 Actually, I think I may be an embroidery junkie already, since immediately after finishing the project I called my local craft store and asked her to reserve for me all the wooden hoops she had in stock and I would be there asap. I have sketched several new ideas that will be in the works this week, and even have my boys doing their own embroidery project (more of their work soon). I hope this inspires some of you to give hoop embroidery a try. If you feel like you may not be able to do the embroidery, but love the look, here's another beautiful idea from purl bee. Would love to hear your thoughts and any creative ideas on hoop embroidery. Let me know if you give it a try. On another note, I am a featured artist on indie junction this week, so be sure to stop over and give them some love. It is really pretty! Sometimes we just have to keep the things we make! I purchased a couple of small hoops about a month ago...but have not given it a try just yet. WOW! I love that embroidery! You should do more for your etsy. I have looked and you don't ever have very much in there that aren't reserved for someone. I really like that fabric idea at the bottom too. Thank you for sharing that, I might try that with some of my fabric. I did contact my local thrift store to see if they had any before I moved on to the craft store, but all they could say as that they'd keep an eye out for me. I just found SouleMama about a week ago and feel like we might be kindred spirits, it's a little crazy ~ especially after ready her post today and having the same experience myself last week. Thank you all for visiting my blog. I'm starting to feel like I am not talking to myself. I'm about to take on some embroidered wall hangings this week. Can I ask you how you did the backing of your hanging? I noticed you used a different fabric. I've been trying a few different ideas and can't seem to find a way to cover the back without it looking sloppy. Thanks! Because the sweater was felted, I was able to cut a circle from it without worry that it may fray. I then carefully glued a little of the sweater to the inside of the hoop, until I made it all the way around. I haven't found an eco-friendly substitute for hot glue, so if you happen to know ~ please share. Good luck!